A crossover between FOX’s Bones and Sleepy Hollow has some fans a little concerned when the powers that be first announced that the two shows would collide this week on Oct 29 for a two-hour special beginning at 9pm EST. However, the promo released left a lot more to be desired. Brennan (Emily Deschanel) and her team come across an over 200-year old skeleton that gets Sleepy Hollow’s Ichabod Crane (Tom Mison) and Abbie (Nicole Beharie) to town to help solve their own murder. Both teams work together to solve what could be the biggest mysteries of the season. 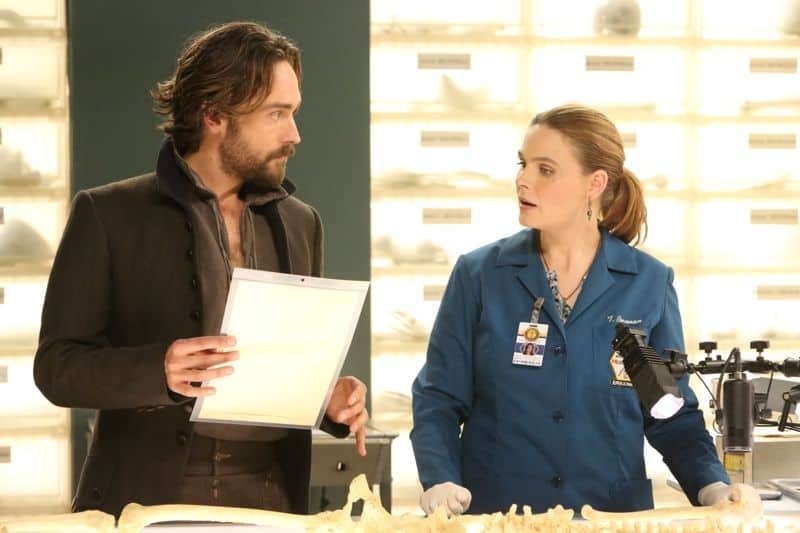 Bones executive producer Jonathan Collier and Sleepy Hollow showrunner Clifton Campbell talk with Seat42F.com about how the two shows will crossover, the hijinks fans can expect, and the trouble these characters are bound to get themselves into. Thank you for talking to us today. I very much enjoyed the first two, or not the first two, but the two episodes. They were really good and great for Halloween. Can you talk about kind of how the idea for the crossover came about, just kind of that journey? Clifton : Okay. Well, when we started putting the room together, Dana Walden had a great idea to see what kind of a marriage of the two shows that we could possibly come up with to see if it could compatibility-wise, pull an evening together in a very fun and a very promotable way. I know that Jon and Michael on their side and me and my team over here were at first, certainly challenged by the idea of doing something like that, but within that challenge, found a great deal of fun in pairing the two up. So we pitched a few things out. We came up with some ideas. The network landed on the idea of making it a big Halloween/pre-Halloween promotional idea and then we got to work. Jonathan : I have very little to add to that. I think we went through similar processes. Michael and I had never done a crossover before. Have you done one Clifton? Clifton : Oh, yes I did one years ago on Profiler and Pretender. Clifton : It was somewhat easier because one of them was in a supernatural show in the other one grounded in reality. And it also involved only bringing one actor from each cast over, not a pairing. I found this one to be infinitely more challenging and therefore entertaining. Jonathan : I would agree with that. Hi, guys. Thank you so much for taking the time today. I am curious. Was it easier to put Sleepy Hollow in Bones or Bones in Sleepy Hollow? Clifton : Oh boy. Well, Jon, you want to start with that one? Jonathan : I will. Clifton please correct me, I would say it’s intrinsically harder to put Sleepy Hollow in Bones because we don’t acknowledge that the supernatural exists. For our characters, it is not a reality, and for Sleepy Hollow’s, both science and the supernatural exist. So we had to have a story where both elements can coexist. Clifton : Yes, I definitely have to give that one up to Jon. That was a tightrope act that they had to pull off and we were able to put our heads together and come up with a terrestrial crime that on second look, had a supernatural bent that we were then able to then take off on in our hour and solve on our side of it. But, it was challenging, I’m sure, for those guys to try and you know, to deal with the realities of our show inside of their own. Jonathan : But, the advantage we had was we got to use these very, very well developed, fully realized characters from Sleepy Hollow, and bring them to our show. It wasn’t like we were starting from scratch. Do you see either team making use of the other in the future? Clifton : Well, Jon, you want to start with that one? Jonathan : We’d love it. Absolutely love it. The whole experience ended up, it was challenging but extremely rewarding. 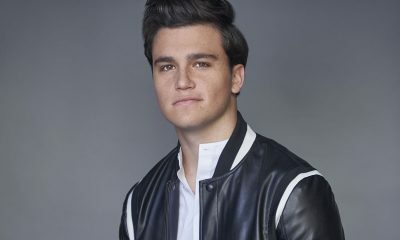 Clifton : Yeah, I would say as daunting as the idea was initially, working through it with the Bones team was a great deal of fun just from a writer’s perspective. And I think the product grew exponentially from those mutual conversations. And I agree with Jon, I would love to do another one. 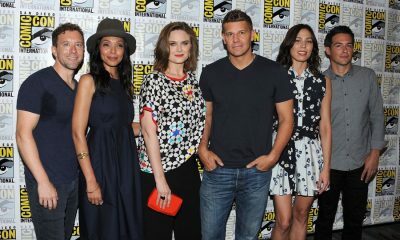 Can you talk a little bit about the new pairings with Booth with Mills and Brennan with Crane? Jonathan : I will start with Brennan and Crane and maybe you can do Booth and Mills. Or either/or. It was incredibly fun for us to get Crane onto our show because we have, correct me if I’m wrong, Clifton, it’s a figure of the Enlightenment to look at Crane, actually. He’s an educated man but from another century who probably would be more like Brennan than not, if he would’ve been born in our time. Clifton : Yeah, I mean it was fun to watch that relationship develop through a couple of passes of both scripts. And, you know, there is a real similarity, albeit more sort of from the intellectual point of view than the visceral side, which is what I’ll then speak to in regards to the Abbie Mills and Booth side. They’re both FBI agents. The interesting part for our side was that Booth is a veteran agent and someone who takes the job and wears it like a second skin, very seriously. 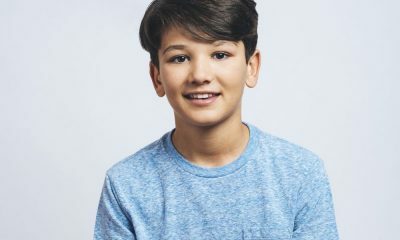 And, Abbie is brand-new to the Bureau and has heard of Booth’s name and it was sort of a natural organic handoff from one show to the other using the Bureau connection and the FBI investigation. And, it really gave us some stuff to play with seeing the veteran sort of help out and support the person new to the job. And because, on Abbie’s side of it, it was a real personal connection and a personal journey to be able to see her, see through the eyes of somebody who’s found a work/life balance in a very unique way in his relationship and marriage to Brennan. That’s also a little bit of a wink to the audience. If you squint your eyes, you can see downrange the questions, and the challenges, and the opportunities that would present a pairing like Crane and Abbie in the relationship journey of Brennan and Booth. Jonathan : And I think beyond that too, beyond the characters, it worked so well with the actors. Clifton : Yeah, it really did. It was fun to watch. Jonathan : You can see it on the screen. Jonathan what would you say to Sleepy Hollow fans who are tuning into Bones for the first time? And Clifton, what would you say to Bones fans who were tearing tuning into Sleepy Hollow for the first time? Jonathan : Oh, gee. Watch your characters get challenged in a way that you haven’t seen before. I think we’re pulling them out of their comfort zone. Not that they’ve ever really ever been in one. That’s the virtue of the show. And we’re opening up a type of mystery that couldn’t be told on Sleepy Hollow. Likewise, we couldn’t, whatever—and I hope that exists on Sleepy Hollow also. I mean our characters would never ever be able to do an episode in our show like they’ve been able to do in Sleepy Hollow. 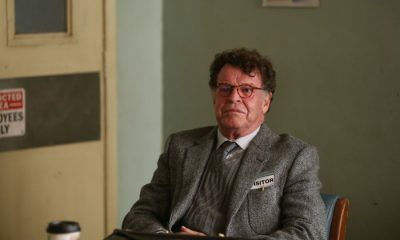 Clifton : And, our side, we have, you know we always sort of have the struggle with accountability and this bubble that we’ve created within Sleepy Hollow, you know there’s so much supernatural and unexplained going on around the police procedural aspect of our show and we don’t want to add open that door up to the rest of the world. So having this much contact with the agency to meet all agencies with the Jeffersonian and their crew was really challenging. And, I think if fans from Bones continue with the storyline and follow in see how we were able to use and utilize the expertise in Bones, they’ll see a fun exchange and really sort of confound the storyline in a an interesting way. Each cast and crew, Bones has been together for over a decade now and Sleepy Hollow for about half of that. Cast and crew create or end up having a personality or entity, if you will. What are the identities of those separate crews and how did they mix together? What was it like when they came together? How did that change the identity of the crew? Clifton : Well, first of all, we were, we were—the Bones side, Jon and Michael and his crew, they were hosts and they were wonderful hosts because we actually shot all of the crossover scenes here in Los Angeles. Sleepy Hollow shoots in Atlanta. So we traveled our cast and our keys. You know, our key department heads and people that really make our show hum, and we were welcome with wide open arms and you know, it felt both in terms of the crew and certainly the cast, that everybody was enjoying the experience and rising to the challenge and you know, the product really shows in the work. Jonathan : And you guys could not have been better guests. I’ve got to say, you never know what to expect. And it could’ve been any number of things but everything wildly exceeded our expectations. Clifton : Yeah, it was a real joy to be on your set and you know our cast and certainly our crew melded very nicely with yours and I think that we—in down times and when we were tweaking lighting and whatnot I caught everybody, both cast and crew, sort of mingling in a really nice way. It just felt really good and it really does show in the end product. What surprised you both? I mean, you know you go in with expectations. But what did you find in the experience that really surprised you and delighted you? Clifton : Well for me, it was the little things that the cast, the actors found that were between the lines of the dialogue in the little moments that they filled in for us, which on their own shows, actors do that on a regular basis. They give you extra moments and little looks and moments that you can pull into the scenes that really resonate with the scenes. But, even if in just the four days that the cast was together, they found those moments intermingled with themselves and I don’t know, Jon, if you felt the same way, but we kept a lot of those interesting little moments of emotion in the final cut. Jonathan : Oh, I would say the same thing. And beyond that, it was just the level of excitement they brought to it. Jonathan : I mean they were just thrilled to do it. It was fun for them, from start to end. They made it fun for each other. Clifton : Yeah and it’s always nice to shake things up creatively. I mean, you know these guys, these are very clearly defined franchises and you know, to some extent that’s the job is to perpetuate that franchise week in and week out, and when you get an opportunity to mix it up as we did, you can really feel the excitement, as Jon was saying. Jonathan : And we shook it up across the board, which is nice too. The way it worked was that Sleepy Hollow brought their keys and they brought their key grip, their key electric, their hair and makeup, but they all worked with our crew under them. Clifton : Yeah, it was an across-the-board lot of fun. Jonathan : We even mixed up the writing rooms. Clifton : That’s true. We traveled over there. We spent some time in your writer’s room. It was a lot of fun. I just wondered if you could talk a little bit more about some of the specific challenges as writers that you encountered when trying to mesh these two shows together that exist in such different universes. Clifton : Well, I think that was probably the part that was, at first, the most daunting. Ultimately ended up, Jon, you may feel the same way, the most rewarding. It was because they are so tonally different. The challenges became, how do we get these characters to do and say the things we need to do to mesh as nicely as it ended up meshing and still stay true to the characters, the voices, and the tone of the show. It was a great deal of exchange back and forth with our writers’ room and the Bones writers’ room on how what sort of plot, what platform, and make the differences you know as seamless as possible, yet take full advantage of the tonal shift. And I found on our side of it for that to be the challenging things in all the right ways. Jon? Jonathan : Yeah, I would totally agree. I would also add that being the challenge for us is how do you get—I mean in our show, we have the world’s most brilliant set of scientists and investigators. And how do you have them be unaware of one reality that’s very aware to another set of characters in the same show? And, it was actually very, very gratifying to work with the Sleepy Hollow team to come up with a solution to that. It’s a satisfying—the case is solved to the satisfaction of our characters, but it also has another dimension for theirs. Clifton : Yeah. And, I think ultimately, at the end, and it was always sort of intended in script, but because the actors were having such a good time mixing it up with each other, the take away at the end of the second hour and the combined hours is, “Boy, you know I would really like to see them do this again.” And, there’s a little bit of wink to the audience that something like that is certainly possible.